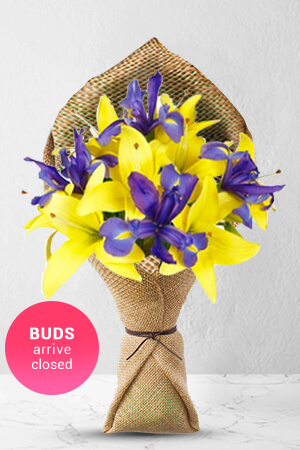 This pleasant floral arrangement of elegant blue Irises and blissful yellow Asiatic Lilies will brighten any room. It is gender nonspecific and perfect for any occasion.Lilies may be sent closed/partially closed in order to prevent damage and to last longer.The featured vase is not included however; if you would like to ensure that your special someone knows just how much you care, we recommend including a Premium Vase to your order. Site was easy to use, with great choices of arrangements shown. Flowers delivered as per order. My sister loved them and ordered from Kenya so it was easier. Good feedback from you & delivery on time! Recipient sent me a photo of the flowers I'd chosen & they appeared exactly as depicted they should!